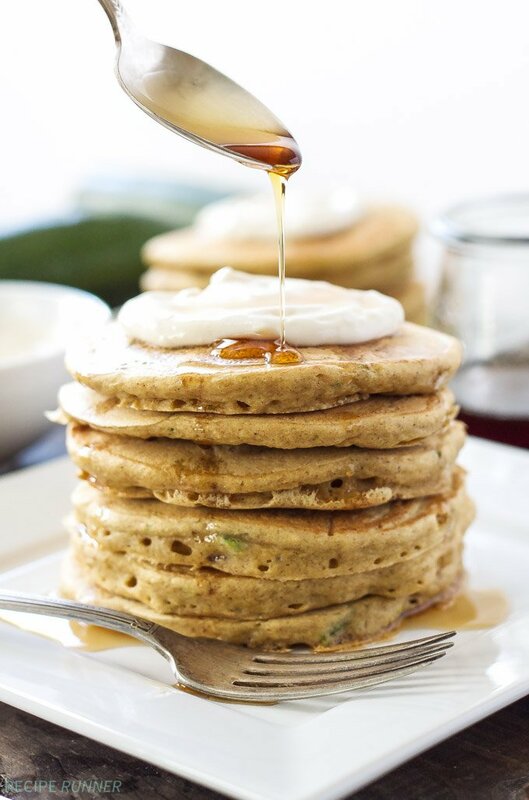 Whole wheat, tender, fluffy, zucchini loaded pancakes not only taste delicious, but are good for you as well! Top them with the maple cream cheese topping for a decadent and delicious breakfast! A few days ago I was finally able to pick a few of the zucchini from the plant in my garden. The little plant that stood 6 inches high when I planted it is more like 2 feet tall by 3 feet wide now! Lucky for me it is full of yellow blossoms which means I’ll have a plethora of zucchini very soon. The first thing I decided to make with my zucchini was these Zucchini Bread Pancakes. I have a deep love for zucchini bread almost as deep as my love for pancakes. So of course it only made sense that I combine the two. 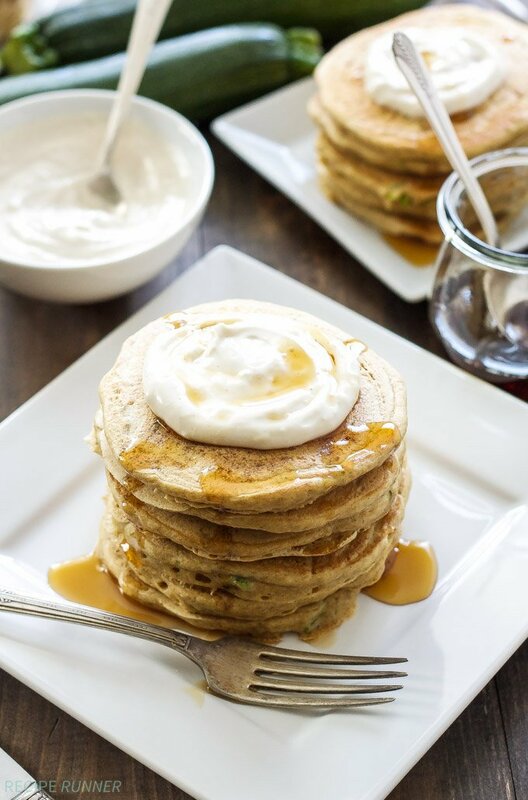 Not only do the pancakes taste like a moist delicious slice of zucchini bread, but compared to a lot of zucchini breads that are full of oil, these pancakes are pretty darn healthy. I used whole wheat pastry flour, which is what I always use when I make pancakes. Then instead of using oil in the pancakes I replaced it with plain Greek yogurt. Not only does the Greek yogurt eliminate the fat, but it also keeps the pancakes extra tender. I didn’t skimp on the zucchini when it came to these pancakes. No sir! They are loaded with 2 cups of shredded zucchini, which is approximately one large or 2 small zucchinis. To give the pancakes that zucchini bread flavor I added in a good amount of cinnamon, a little nutmeg, and of course vanilla extract because I add it to pretty much everything I bake. I decided to skip adding nuts or raisins this time, but pecans would definitely be a good choice if you decide to add some in! To top the zucchini bread pancakes I decided to make a maple cream cheese topping. I can remember as a kid loving to spread a layer of cream cheese on my zucchini bread, so it seemed only right that I make a topping reminiscent of that. The topping is simply low fat cream cheese, Greek yogurt, maple syrup, and vanilla extract whisked together until it’s smooth. Slathering that maple, creamy, goodness on top of the pancakes was just what they needed, not to mention much better for you than drowning them in butter! In a large bowl whisk together the dry ingredients for the pancakes. Add the wet ingredients to the dry and fold together until combined. Stir in the shredded zucchini then set aside. Preheat a griddle per the manufacturers instructions. While the griddle is heating, whisk together all of the ingredients for the maple cream cheese topping until smooth. Scoop about 3 tablespoons or a scant 1/4 cup of the pancake batter onto the greased griddle. Cook the pancakes for about 2 minutes or until bubbles form on top, then flip them over and cook for another 1-2 minutes. Serve the pancakes warm topped with the maple cream cheese topping and more maple syrup if desired. 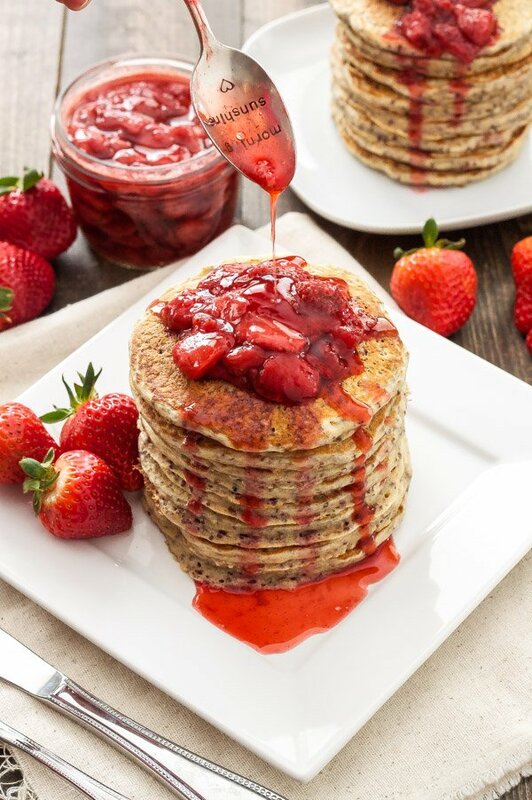 I am TOTALLY obsessing over these pancakes! I could eat pancakes for every single meal, and I actually COULD with these because they're healthy and protein packed right?! Pinned! Thanks Taylor! You could totally eat these for every meal. Whole grains and protein, can't beat that in a pancake! This is such a great idea! I love adding vegetables to pancakes because my son has no idea & gets an extra does of veggies. I have to try these! Thanks Julia! 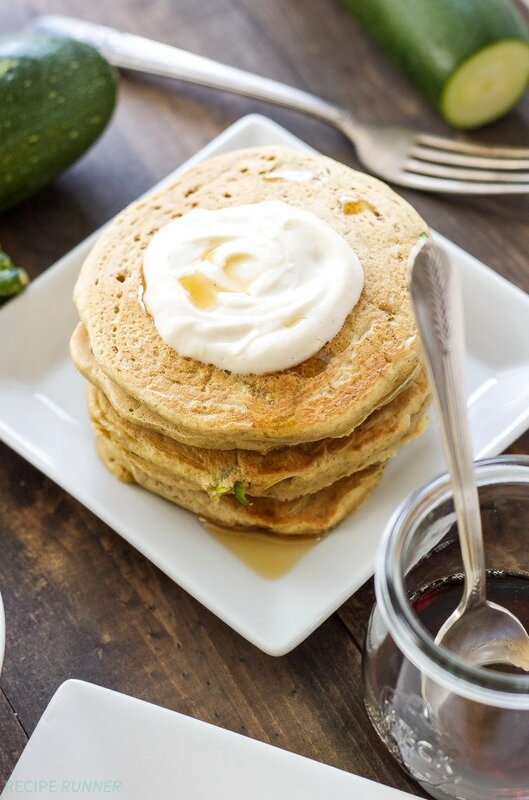 Zucchini is a great vegetable to hide in pancakes, kids will never suspect it! Um this is breakfast perfection! I just made greek yogurt pancakes and I freaking love how fluffy they get! And I love the idea of adding zucchini...definitely making these soon! Thanks Meg! I'm always adding Greek yogurt to my pancakes, I love it! Oh my goodness, these look SO good! I have a bunch of zucchini plants in my garden too, and I can't wait until they're ready to pick. Pinning this recipe for later! Thank you! I know I'll be making these pancakes more than once with all the zucchini I've got growing in my garden! Oh wow - what a great looking pancake! 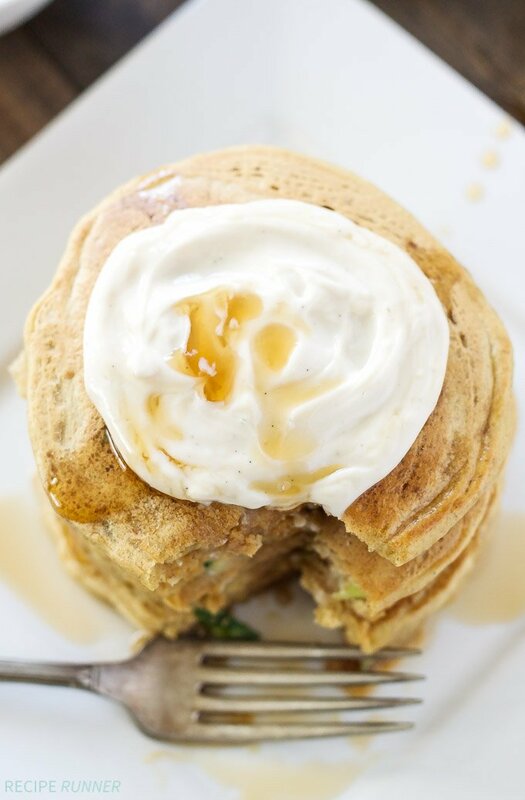 One of my all-time favorite sweet breads is zucchini bread, so I know I'd love these pancakes. Thanks Ally! You'll love the pancakes! These pancakes look SO delicious, Danae! Zucchini bread is one of my favorite things in the world, so I know I'll love this!! Thanks Lisa! Zucchini bread is the best this time of year! With all of the zucchini in my garden in the summer I am always looking for new recipes! 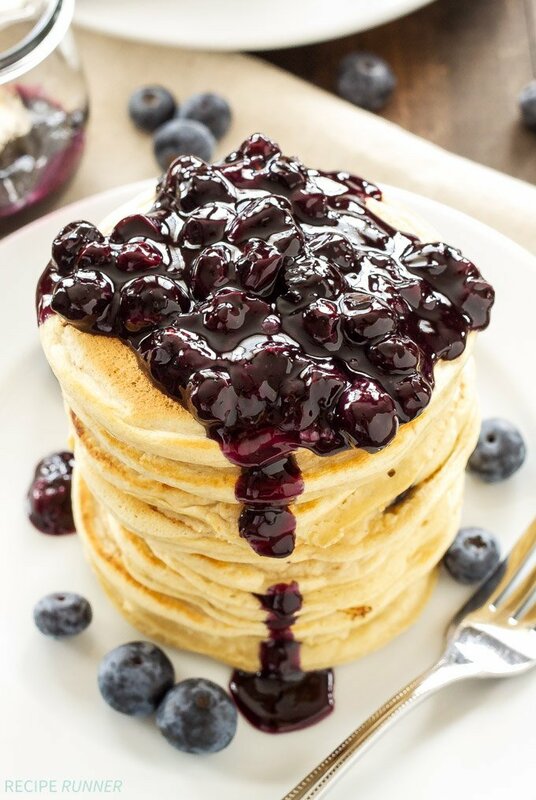 This stack of pancakes looks so good, I want it for dinner! Thanks Ashley! Sometimes there is nothing better than a stack of pancakes for dinner! Totally jealous of your zucchini plant! I keep telling myself that I'm going to break our HOA rules and grow a zucchini plant because I love zucchini and would be happy as a clam if I could have them growing in my back yard! 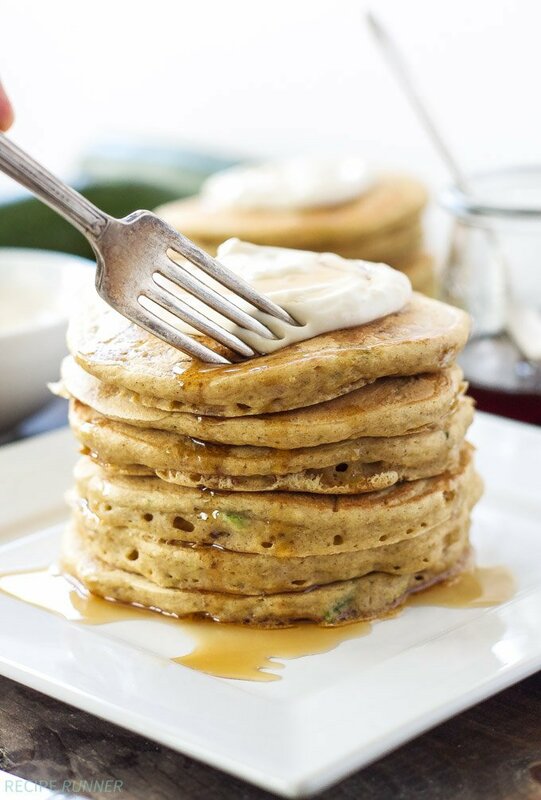 I LOVE these zucchini bread pancakes, Danae! 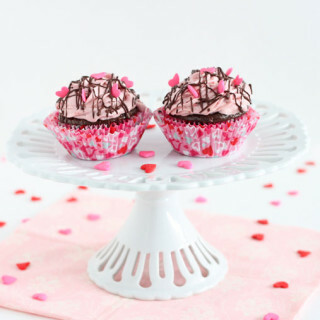 I'll have to make these for the boyfriend one weekend. He often requests pancakes and now I have a great new pancake recipe to try! Ugh you can't plant a garden?! 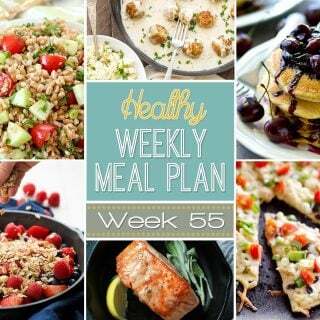 I think you should break the rules and plant yourself a zucchini plant, it would come in handy with all the zoodle recipes I've seen on your blog! I hope you and your boyfriend try out the pancakes and love them! My dad has zucchini coming out of the ears over the summer! I just sent this recipe and told him we needed to try it when he comes to visit this weekend!! These pancakes are amazing! So thick and fluffy, and I love the topping. 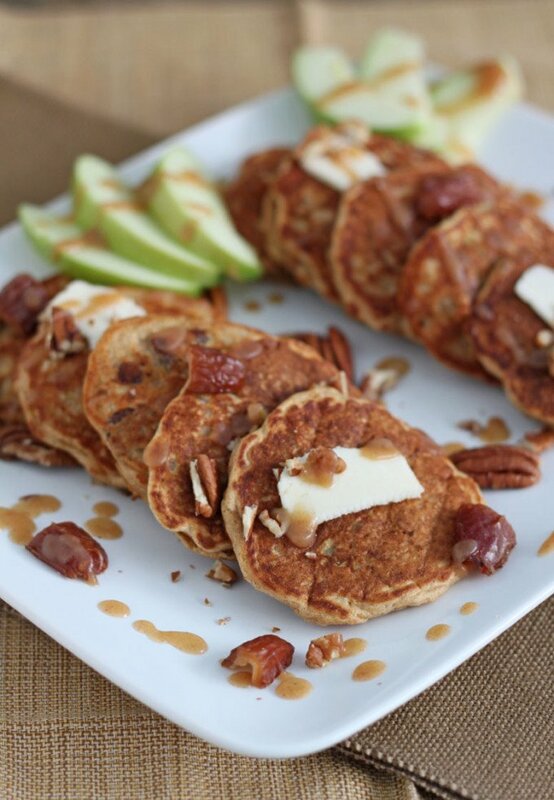 What a great idea to turn seasonal zucchini into this breakfast treat! Thanks Patricia! The cream cheese topping was to die for on top of the pancakes! When I think of zucchini in pancake form, my mind naturally goes to fritters. This is a great idea! I especially like the topping of cream cheese. I'll have to try this with all of my fresh Summer zucchini. I love summer squash so I'm always STOCKED with it during the season. Well, after the season too if I'm honest. I seriously can eat pancakes everyday, specially healthy ones! I was just thinking this morning of making some zucchini pancakes. These look yummy, need to try asap. Pinned! Thanks Ana! I totally agree, I could eat pancakes every day too!